Dense clouds begin to move in over the town of Tadoussac in Quebec, Canada with the threat of a storm which will leave the boats docked at the marina for the night. Plenty of open space is available for those who stop at the marina as they can tie up along the wharf or have the luxury of front row parking close to the beach. The town of Tadoussac has a population of approximately eight hundred and fifty, but during the summer months the town seems much busier. Many tourists flock to Tadoussac for the whale watching tours while others simply like the beauty of the golf course, the quiet beach or the tranquility around the town. 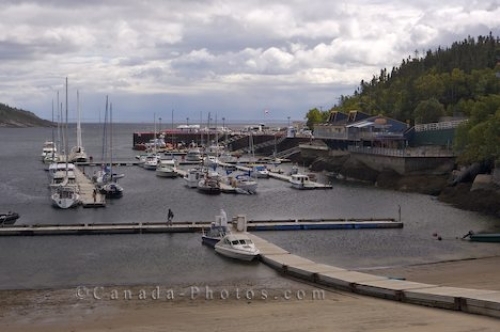 Marina in the town of Tadoussac, Route des Baleines, Highway 138, Manicouagan, Gulf of St Lawrence, Quebec, Canada. Picture of the boats in the marina in the town of Tadoussac in Quebec, Canada as the clouds thicken over the water.